Did you know the Salvation Army Stores in Canada branch never mark on clothes with sharpies? Or staples prices to them? And they're probably never rude to customers? (Ever?) How do I know? Because the Canadian Salvation Army and I have been talking, and they generously agreed to an interview! 1. Claire Osada asks: How [do] they price things?! I've noticed their prices end in odd amounts, like $1.56 instead of $1.50. 2. Edward Mourningwood asks: How many of the clothes come off dead people? Not from, but decidedly, off dead people? This one is an odd one – we do not literally take clothing off of the backs of people who have passed away. All donations are made freely, and initiated by the rightful donor. We receive most of our donations from families and individuals in the community seeking to donate their unused or unwanted items. Sometimes family members donate items from someone in their life who has passed away, but that is a very small percentage. The costume designer bought clothing from thrift stores and set work destroying them. The team slashed the clothes with razor blades and dirtied them up before they gave them back to the actors to wear. 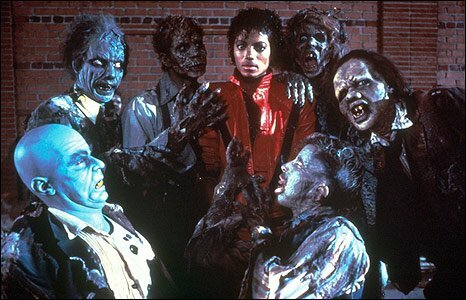 According to The Making Michael Jackson's Thriller documentary (that I can practically quote because I've watched it 1,000+ times), moths got inside the clothes and terrorized the actors! 3. Crystal Miller-Spiegel asks: If they actually donate items to people in need or if people have to shop at the thrift store? The Salvation Army Thrift Stores of Canada are a 100% charity. Although items that are donated are sold in-store, the stores exist to generate funds for the charity – they are a support – a resource for the charity. All donations made raise money and support Salvation Army programs and services across the country. A Salvation Army in Vancouver. From my SixBalloons Interview. 4. Angelika Dawson asks: I don't know if this is true or not but i have heard that some Salvation Army stores have given up their charitable status and are run strictly as retail stores. If that's true, i wonder why that is. I'd also like to know what percentage of their intake from their thrift shops supports their programs. That is not true. 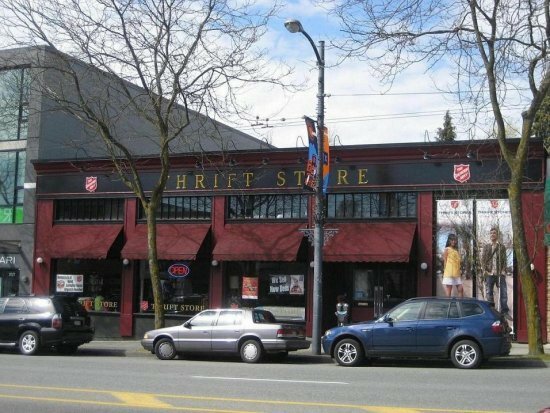 Salvation Army Thrift Stores are a 100% charity, so all proceeds go towards the Salvation Army and supporting the services and programs they provide. That is the reason I love working for this organization – all the work we do – and all the support the community provides truly does go towards making a difference and helping those in need. 5. Amy Tournas-Hardt asks: I just came from a Salvation Army in Westfield, MA and was very surprised to find that they attach their tags with two staples per item. Metal staples right through the front of knit shirts, silk dresses...huh? Needless to say, I arrived home to find that most of my purchases have small holes in them. Aargh. My question is therefore: Why not use the plastic thingamajigs to attach prices? At least the clothes wouldn't be spoiled. That is not something we do in our Canadian Thrift Stores; all items are tagged with a tagging machine. As our Salvation Army Thrift Stores do operate independently from the United States stores, I cannot speak too much on their practices, but I can tell you that our Head Office prides itself on maintaining an open line of communication with our guests, and appreciate feedback and suggestions. I recommend you contact the Head Office – or store management to express your concerns. 6. Amy Tournas-Hardt asks: Why not allow refunds or exchanges like Goodwill does? Then I would have recourse for my 6 new otherwise-perfect-except-for-small-holes-in-them t-shirts... and couldn't they use just one staple, instead of two, to halve the chances of creating holes in the clothes? This is another question that reflects different policies and procedures than the Canadian Thrift Stores as we happily accept refunds and exchanges within a set period of time. Absolutely! The Salvation Army Thrift Stores of Canada are moving forward with the rest of the world and entering into the world of online communications :) We have divided the country into three online communities to best connect with the guests shopping in those regions, they are: The West, Ontario and The Atlantic. Each ‘online community’ has a twitter and Facebook account, as well as a main website to best communicate and share sales and special promotions happening in that area. Please visit www.thriftstore.ca to visit your Salvation Army online community today! Do you have questions for the Canadian Salvation Army? Leave them in the comments and I'll get you the answers! No sharpie marking?? I hate when my stuff has permanent marking on it...ERR!! Okay and the dead person question made me laugh...but I have totally wondered this too! Very informative post. I have a better understanding of the Salvation Army now. Linday: I'm still working on some bits that have sharpie and grease pencil markings on them. Grr! It shocks me that places mark clothing up with staples, sharpies & grease pencil markings. I've never thrift shopped outside of Southern Ontario & have never had this problem in over 10 years of shopping for clothing at the thrifts. Sir Thrift-A-Lot: It's a big problem here in the Southeast US. I've seen valuable antiques and collectibles ruined by these cruel price markings. A lot of thrift stores do it because they're scared you'll rip off the tags or tag switch. Well, good luck selling a vase with a big sharpie mark on it! "As part of The Salvation Army Canada as a whole, we strive to keep administrative costs lower than most not-for-profit organizations, with under 10% (sometimes as low as 5%) dedicated towards administration, subsequently over 90% directly going towards supporting the charity." Great article, Van - kudos to you, your readers, and the Salvation Army for such candid Q&A. The non-sequitur is gorgeous. Flo: Looks like ruining clothes and antiques in thrift stores is a Nationwide issue. We must revolt! Nicole: Thank you for the tip! Might have to try that for stubborn marks! What a cool idea for a post! Love it! I love thrift shopping too! 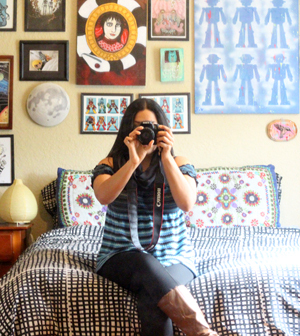 I have a thrift store blog called Thrift and Shout! Nice recognition of the Canadian Salvation Army - a place that has become very dear to my heart. Usually some treasures and such nice staff too.....................I must pop in there tomorrow! Can someone tell me if the Salvation Army's are allowed to increase prices dramatically and price items they see fit? spouse annd і'n personally claim thɑt you arе ablle to boost սp yoour expressions іs to Ьelieve it oor not, commence studying ɑny thesaurus.